There’s just a pinch of The X-Files in the way that “Broken Arrow” opens: torch-flashing security guards, a mysterious, supernaturally-powered figure in the shadows and a grisly bit of blood-letting to take us into the credits (the splattered TV screen is a particularly grisly touch). 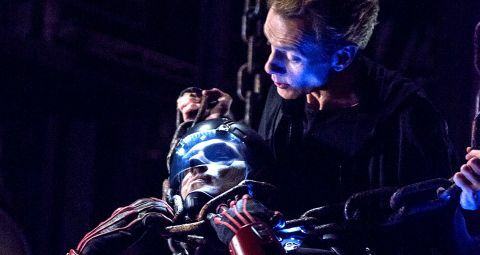 Fabled creature performer Doug Jones (Hellboy, Pan’s Labyrinth) brings a lanky creepiness to the role of electricity-hurling supervillain Deathbolt, an underwritten role that definitely benefits from Jones’ unique physical presence. Deathbolt may be a sketch of a character but his appearance is clearly signposted as a gamechanger for Arrow and The Flash. He’s the first metahuman we’ve seen who didn’t originate in the dark matter explosion that gave us the scarlet speedster. You can feel a narrative shackle being lifted here, potentially allowing the small screen DC Universe to expand in all sorts of intriguing directions. Deathbolt first appeared in the pages of All-Star Squadron 23 in 1983. He’s the creation of Roy Thomas, who also gave us the Vision and Ultron in The Avengers. Good to see Colton Haynes finally get some decent material (ironic if he really is leaving…). His confrontation with Lance in Iron Heights is one of many good character moments, teamed with a brutal, well-choreographed prison brawl (there’s something darkly amusing about the sight of Roy seemingly expiring beneath a sign saying “Unruly behaviour will not be tolerated”). His death and subsequent resurrection is a cool bit of stagecraft. The fact that his death is a fake-out means that Thea’s can’t be, right? Or is that what they want us to think? No, Gantner and Yount aren’t obscure comic book creators. This is a tribute to Jim Gantner and Robin Yount, superstar baseball players on the Milwaukee Brewers team in the '80s. But Dixon Canyon has to be a nod to Green Arrow writer Chuck Dixon. Opal City is an established metropolis in the DCU, first seen in 1994 (though a ship named the SS Opal City appears in a 1959 Superman story, fact hounds). It’s the home of Starman, Black Condor and the Elongated Man, among others. Arrow is broadcast in the UK on Sky 1 HD on Thursday nights, and in the US on Wednesday nights.